Seven years ago, Hubert Strong left Haskell, Wyoming, intent to seek his fortune and make a name for himself. He left with a promise to his sweetheart, Bebe Bonneville, that he would come back for her when he had enough money to give her everything she deserved. When Hubert returns, richer, wiser, and more world-savvy, he expects Bebe to fly back into his arms so that they can have their happily ever after at last. But Hubert is in for a huge surprise. Life has been cruel to Bebe. 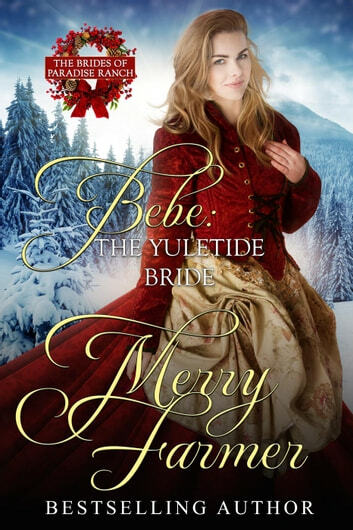 Her father has died, her family’s ranch is about to be foreclosed on, and the only way she can save it is to marry her father’s secretary, Price Penworthy on Christmas Day. And when Hubert walks back into her life, her fury at being abandoned reaches an all-time high. But Price Penworthy isn’t what he seems, and Hubert knows it. He has his hands full trying to uncover the truth and convince Bebe to take him back. With time running out before the Bonnevilles lose the ranch, can Hubert and Bebe work through a mountain of misunderstandings to rediscover their love? Or will everything fall apart before the clock strikes midnight on New Year’s Day? If you would like to read this book with “scenes”, check out His Yuletide Bride.